New 1701P... what brought me here. Topic: New 1701P... what brought me here. My new 1701P silhouette review from day one. The search for input on this pistol purchase is what brought me here to CAPOF. The lack of info on this "high end" Crosman pistol is amazing to say the least. It seems to be a prefered "donor" for it's trigger group is what you will find, but it comes with an LW barrel and the acclaimed trigger,plus a lot of other upgrades.... so I wanted one for my own to try out. I hope this review helps others in the future. After liking what I read, I went ahead and ordered one from Crosman direct and here is why. Mother Crosman website on the other-hand has an MSRP of $374.95! HERE (Don't know where PA got their info but oh well). I purchased it direct from Crosman on "Free Shipping Friday" and entered the 25% off "AGNATION" coupon code and got it for $300 shipped to my door. On Friday I got an order Confirmation. Now, Take out Saturday and Sunday weekend. Monday I got an order Shipped with tracking info. Today, Wednesday, the pistol was delivered and shortly after I got a delivery conformation email. WOW! The pistol arrived double boxed and the inner box has egg crate foam to protect the contents... NICE! My only qualm is on the outer box side was a sticker that said "PISTOL, 1701P, SILHOUETTE" and the top was the factory sticker with the GUN SPECS. So ANY unscrupulous employee at UPS could plainly see what the contents was and claimed "lost it in shipping". Fortunately, that was not the case for me. Upon unpacking, I was pleasantly surprised to find not only the BEAUTY pistol, well preserved in oil...but a 25yrd "Proof Target" of 5 shots in a keyholed pattern. I have only seen this on my high end target rifle purchases... I understand now this is what Crosman believes it is slated to be.It arrived with 1000psi on the gauge. I do not know what they ship them out with but to me this is a good sign of no leaks. Tonight I am going to "oil her up" with a rub down on the exterior surfaces with Breakfree CLP on a cloth and clean the barrel with "Goo-Gone" then plenty of dry swabs. Then I will mount the Cocobolo wood CCS grips I have waiting for her and the BSA Edge 2X20 scope. Re: New 1701P... what brought me here. Welcome to the forum. I think you will be very happy with the 1701. Welll.. all I can say is WOW! I pulled a "Goo-Gone" wetted swab through the barrel and it came out almost clean. Polar opposite of my previous guns. Usually the first is "cosmolene brown" So I followed with 5 dry ones and then began the wipe down of the exterior.... Ooooh pretty! I put on my wood grips and instead of mounting the BSA scope, I went with my "spare" iron sights. After all this is just a trial right? Aired it up with my Joe B. "ExpertHPA" 1600psi regged Ninja bottle that had 2200 psi on tap. This Regulator has been dead nuts accurate at 1600psi for a year... but after the fill (attempted twice) the guns gauge read 1300psi. First thing I noticed was QUIET! no moderator needed indoors. Next was the R-10 pellet went exactly where the sight was when I pulled the trigger... and I mean exactly! As soon as I took the shot, I knew where it was going to be. Then.. the trigger is amazing out of the box. Once I get better I may tune it, but for now it is crazy smooth compared to my "tuned" 2240 trigger, even my adjustable 2300KT set up. First 2 shots were high, the remaining shots got steadily closer to the bull. ....and that is the FUN of all this right! How is the breech and tube finish on that pistol? Is it bereft of anomalies like nicks, uneven anodizing, scratches, etc? Nice writeup for the 1701P. As mentioned, there is little or nothing to complain about with that shooter. It just hits where you aim it. I found it took me about 30 shots a day to get in the bull on a consistent level. Practice-shoot-practice-shoot-practice. Enjoy your new pistol (congrats) and have fun and please keep sharing. Thanks folks, The night flew by, it was late and I realized I hadn't eaten supper yet. Could not put this pistol down! The finish is a nice even matte, no knicks or blems. The lettering is quite crisp.... and the barrel, tube and breech match each other very well. It comes with no sites you said? Yes, no rear sight but it does have a front. I want one! Maybe next Christmas. Correct, no rear sites. I mounted the set of "Match Sights" I had gotten from Alchemy a couple years ago. They are actually a Chinese piece, I believe what comes on the QB air rifles (SAG). Sold on Steve Archers website as well. 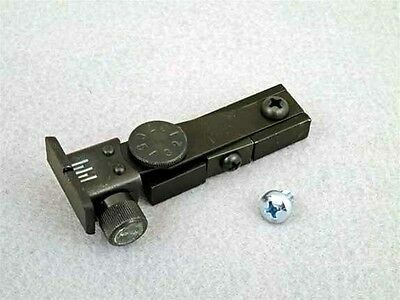 Thos have a history of not being able to be lowered enough on the elevation (shoots high) on Crosman pistols without an extended front sight pin. This was the case on the 1701P as well, I was adjusting the POA to compensate. Thanks for the interest folks, I will post more when I get another chance to play with my new toy. Nice. I might get to shoot one of our club 1701Ps tonight, if the mood strikes. I used my hand pump and counted 24 strokes to get it from 1000psi to 3000 on the pump's gauge. The gauge on board the pistol read 2800. I wanted to see just how accurate the pistol is taking as much of "me" out of the variables as possible. I set up the indoor 10M bench range (AKA: card table in the family room thru the open door to utility room) and got the bag at arms length. Used the 8.2g Meisters. 1) That sight does not adjust elevation "down" far enough, I was having to have my POA at an exaggerated 6:00, just like the 1377 and 2240. HOLEY COW... what a PISTOL! It was SO easy to zero the scope because each 5 shot group was a large single hole. This thing scoped off the bag is just as accurate as my match rifles. I also wanted to get an idea of shot count off a full charge. I recorded the shot and the pressures every ten shots after mounting the scope... shooting it down until the accuracy fell off, sorta, more like the POI lowered but it still grouped well down to 1100psi indicated. So that proved to me this pistol can get 70 usable shots will little to no change in POI, I wish I had a chrony but the power seemed to change very little. All in all I am thrilled with this pistol. Next will be to see how I do off hand with a scope, then what pellets it prefers. I plan on picking up a few tins of the 7.0g Meisterkugeln pistol wadcutters as all I have are the rifle weight 8.2 Meisters and R-10's... and just a few RWS Basics in 7.0g left in an old tin. Thanks for reading guys... this is a HOOT to SHOOT! Stainless steel screws for the grips, stainless steel screws to old the top end on and a nice stainless steel safety and Stainless Steel screws for the rings.. I am a "repeat customer" of AlchemyAirwerks. Might have to give Dave a call.